Where is the code again? Last time we looked at config maps/secrets. So for our demo app I wanted to make a change such that when the livenessProbe GET endpoint was called the result would be either a Success (Http Status 200) or a BadRequest(Http Status 400) which is picked randomly. 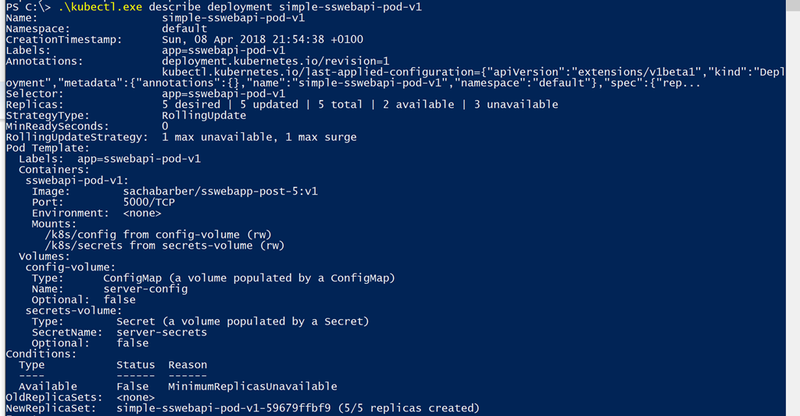 Well its obviously just to satisfy the demo such that when asking for more than 1 copy of the app when scaling up the deployment, we can simulate some random unhealthy behavior which should cause Kubernetes to kill the offending pod, and create a new one to satisfy our deployment requirements. You would not do this in a real health check endpoint. Sometimes, applications are temporarily unable to serve traffic. For example, an application might need to load large data or configuration files during startup. In such cases, you don’t want to kill the application, but you don’t want to send it requests either. Kubernetes provides readiness probes to detect and mitigate these situations. A pod with containers reporting that they are not ready does not receive traffic through Kubernetes Services. Readiness probes are configured similarly to liveness probes. The only difference is that you use the readinessProbe field instead of the livenessProbe field. Another way to think about readinessProbe maybe that your app has other dependencies that also need to be started before your app starts. Say you need to be able to communicate with another database, that also needs to be running before your app is deemed ready. You could work this logic into the value you return from a readinessProbe. All good only 1 instance of our pod there too. So that’s it, we have reached the end of this mini Kubernetes journey. I hope you have fun following along. I have had fun (and some tense moments) writing this series. Last time we continued to use services, but last time we showed how you can use service to expose a singleton, such as a database, where we expect there only to be a single pod behind the service. 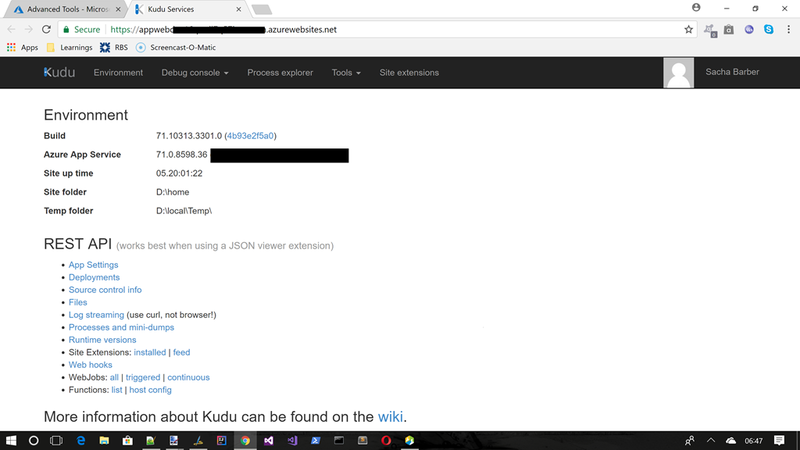 We also talked about DNS lookups for aiding in discovery and finally using ClusterIP : None, which allowed us to address the pod directly. ConfigMaps allow you to decouple configuration artifacts from image content to keep containerized applications portable. This page provides a series of usage examples demonstrating how to create ConfigMaps and configure Pods using data stored in ConfigMaps. I am just going to concentrate on “Create ConfigMaps from files” as that fitted the bill of what I wanted to do with the pod that I have been altering for this series of posts. So lets have a look at that shall we. 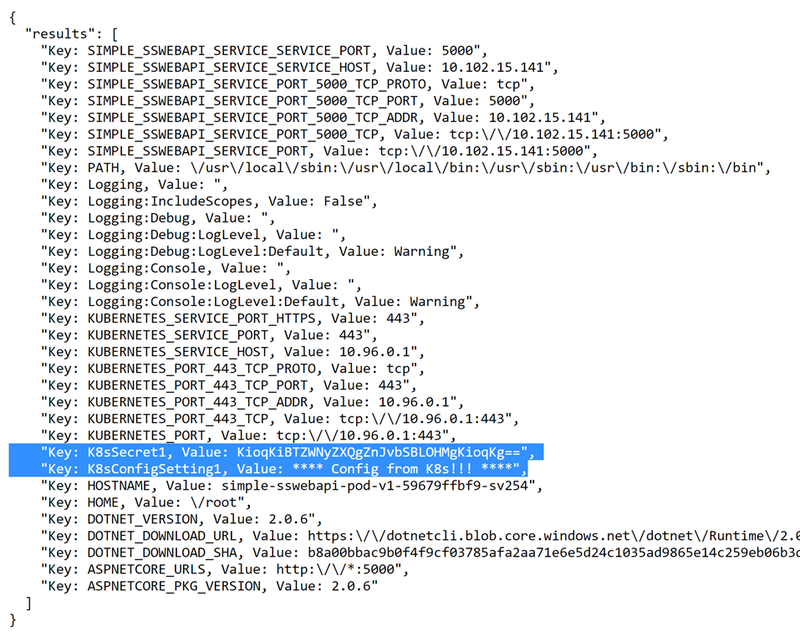 "K8sConfigSetting1": "**** Config from K8s!!! ****"
But hang on my file is called “sachaserver-properties“, so this should match the regex required by Kubernetes. Can you spot what’s wrong. That right the path is being used as part of the filename, which Kubernetes doesn’t like. We will see why in just a minute. The other interesting thing is what happens with the original file(s) content. The content from the file/files is used as the value for the key (representing the file) inside of the Data section. As you can see this “sachaserver-properties” key does indeed contain all the original contents of the file that I showed above. So that’s pretty cool. But what can I do with this ConfigMap? Can we test this out before we move onto changing our main pod? It’s not a lot of work to upload a new image to Docker Cloud, but I am the sort of guy that likes to know things work before I upload it somewhere, and then have to tear it down, and redo it again. 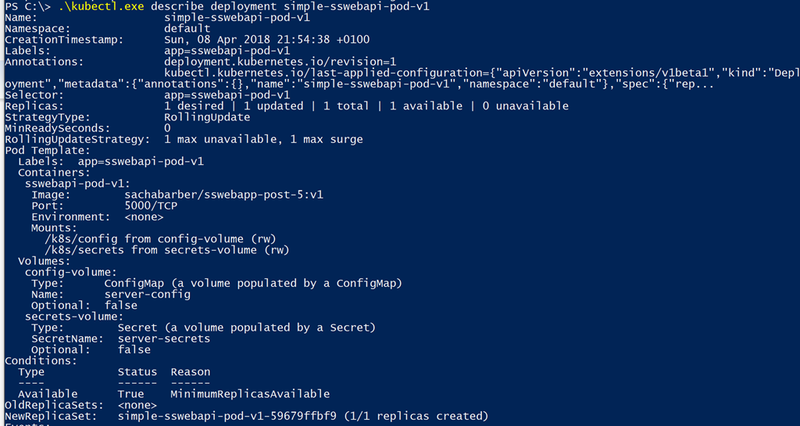 So is there a way that I can check this ConfigMap stuff is working as expected locally using some existing Docker image before I change the code for the pod that we have been using to date for this series of posts? Ok, so that is good looks like the mount is working ok. There is a slightly different command like to run, and the way you mount the volume in your pod is also slightly different, but conceptually its not that different (right now, but I would imagine this might change to use some other mechanism over time). 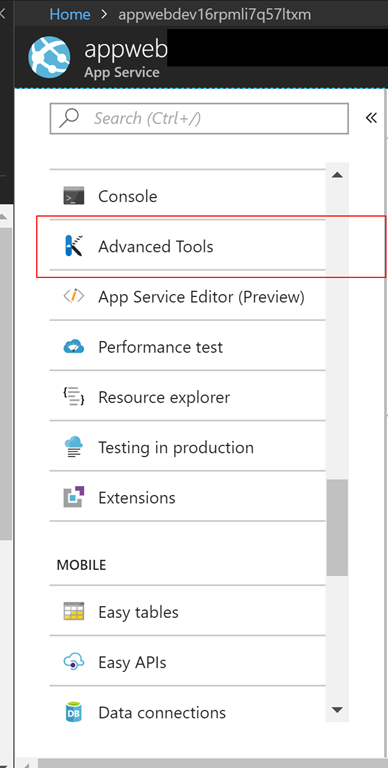 What’s changed in the demo app? Ok so far no blockers, what have we got working so far? So what do we need to change to support the configmap/secret stuff that we are trying to demo for this post. 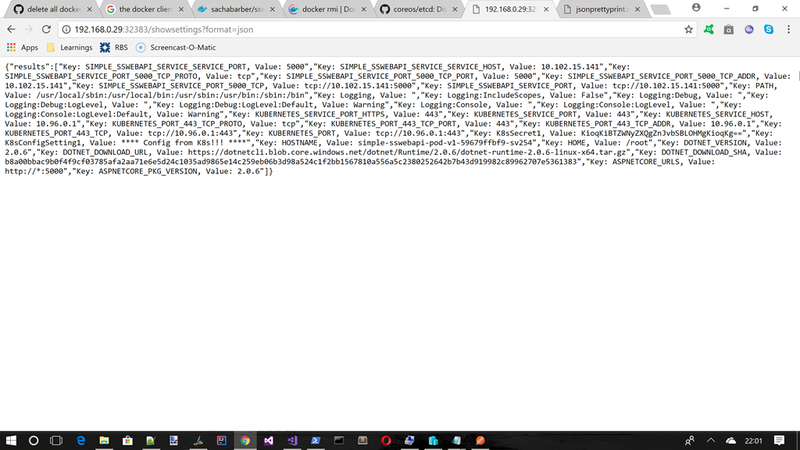 Ok so now that we are reading in these file values, we obviously want to ensure it is all working, so lets have a new route to expose all the settings that have been read in by the .NET Core configuration system. Where we are obviously expecting our configmap/secrets items to be part of that. So we have talked about creating the configmap/secrets and how to test them out using our friend, busybox. 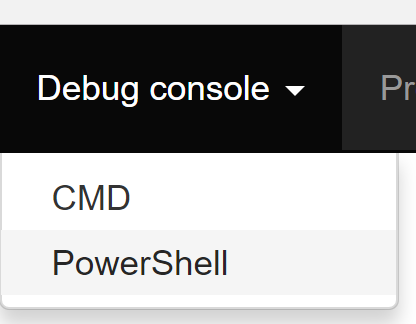 We have also talked about how we modified the ongoing pod/deployment that this series of post has worked with from the beginning, where we have exposed a new route to allow us to grab all the settings the .NET Core configuration sub system can see. Aha our configmap and secret values are there. Superb its all working. Obviously for the secrets we would still need to decode this from this base64 string to get our original value. But this does show everything is working just fine.